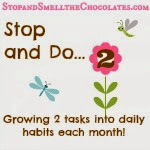 Stop and Smell the Chocolates: Time again for the Bloggy Giveaways Carnival! 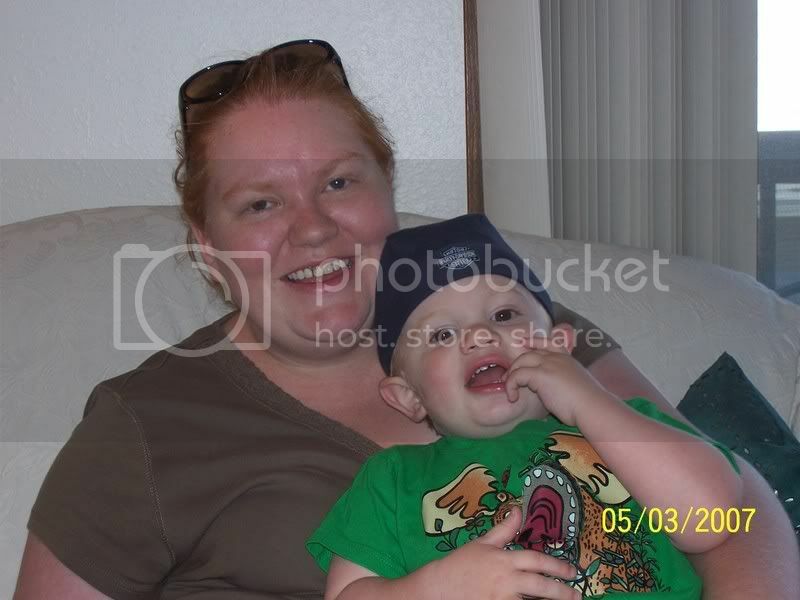 Time again for the Bloggy Giveaways Carnival! Yay for the Bloggy Giveaways Carnival! You HAVE to go check it out - you will amazed at the huge number of giveaways and it's a great opportunity to visit some new blogs! This time, I am giving away 3 items (it was so hard for me to just choose 1 winner last time). The first is chocolate-scented. It's mark chocolate orchid shower wash and body butter - yum. The second will be chocolate-scented if you make one of the recipes! 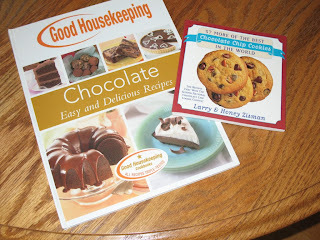 It's 2 cookbooks that include chocolate. And the third is something for the kiddos - I received it and want to pass it along. 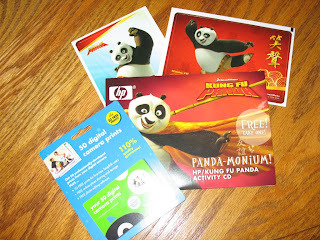 It's a Kung-Fu Panda activity CD, 2 stickers, and a Snapfish gift card for 50 digital prints. 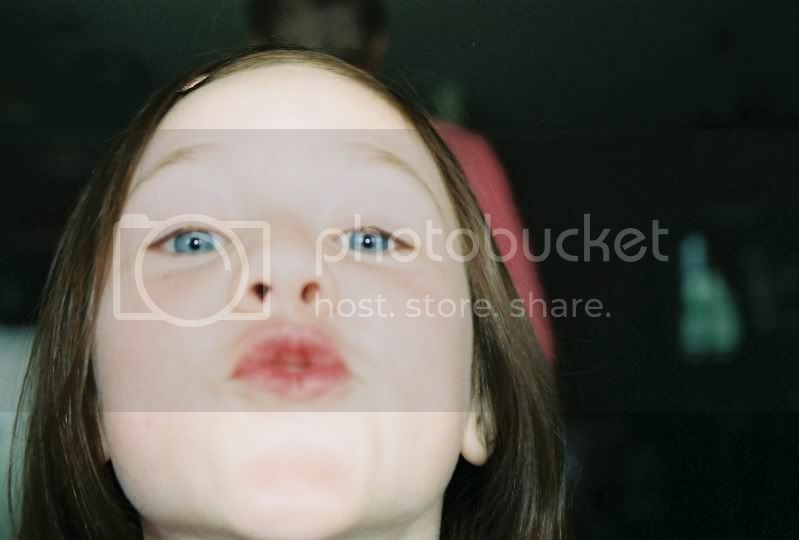 I had so much fun the last time when you left comments about when you ate chocolate! This time I would like you to leave a comment telling me what your favorite candy bar is and I will still like you if it doesn't contain chocolate! On the evening of Thursday, 7/31, I will randomly choose 3 winners and e-mail them. This giveaway is only open to people in the U.S. - you don't have to be a blogger, but please make sure you give me a way to contact you if you win. If the winners don't respond in 4 days, I'll choose new ones. I would love those chocolate cookbooks. My favorite candy bar? Well, I love Fox's Echo Bar in mint chocolate. (Fox's is English, but you can get it at Cost Plus.) I also love Kit Kat bars and anything Ghirardelli! Oh my, the chocolately goodness!! Please enter moi, Ms. Chocolate! I've been around the block a few times about candy bars ... tried the crunchy, tried the smooth, tried the caramel, the cookie, the fudgie ... and my official favorite is Hersheys with Almonds ... mmmmm ... gotta go get one soon! Thanks for the awesome giveaways!! I love the new Bliss Raspberry Chocolate! MMMM!! The Best!! Lisa, I just saw the post about your step-mom and am so sorry for you, your dad, and her family! I'm so glad for you all that you have great memories of the last week you spent together! My prayers are with you, and wishing you safe travels! My favorite chocolate bar is a Butterfinger...yummy! 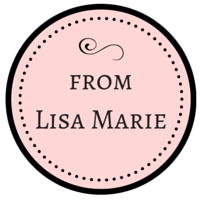 I have really been enjoying your blog, Lisa. If I win, I'd love the body butter and wash, who doesn't want to smell like chocolate? I like Toblerone and PayDay. Reese's, Reese's, Reese's.....did I mention my favorite is Reese's? lol I really like on the holidays when they have the Reese's Christmas tree or Easter egg..yum. Thanks for the contest! Chocolaty yumminess. My favorite candy bar is probably a Snickers bar. The nuts and caramel and chocolate. Yummo. I hope I win the cookbooks. Then I would definitely have a chocolate recipe to post every Friday lol. I LOVE LOVE LOVE LOVE LOVE chocolate!!! People who dont..are INSANE! And..i'm in need of some new body butter right now too! LOL! My FAVORITE candy bar is mr goodbar.......with snickers coming in a VERY close second....aw heck..what am i saying..i LOVE anything chocolate! I never met a calorie i didnt like! Chocolate, coffee, and men.......all better when they're RICH! love the body wash! Umm, my fav candy bar is butta finga! will you include it if I win? oh, b/c now I am craving one! My favorite candy bar is Cadbury Fruit & Nut. I love Whatchamacallit's candy bars! I love 100 grand bars, yummy!!! I would love to win this! 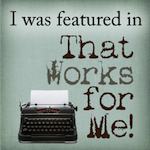 Please be sure to visit my giveaway, too! I would like to win the chocolate orchid shower wash and body butter. I'm sure you'll never want to leave! My favorite is Almond Joys. Well,lets see. Favorite candybar would all depend on my mood. I love Paydays, when I need salt and sweet. I love Snickers when I want chocolate and nutty. Butterfingers are good too. So you see, I could eat about any candybar long as it does not have coconut in it. ummm, makes me hungry. Hi Lisa, you don't have to enter me into the drawing, I just wanted to say that I'm sorry I've been "missing" lately - I still read your blog, but most days I just don't feel like leaving any comments because...well, I don't feel well. Hopefully I'll be back to normal self soon! I love chocolate! My favorite candy bar? ANYTHING with chocolate and peanut butter, I think that combination is pure bliss! Milky Way is my favorite candy bar. Great givewaway. Thanks for the chance. Now I am craving candy bars! As I sit here and think which one I like best. I think I would have to say Snickers. Yum. Mounds or Almond Joy are fantastic! Any chocolate, all chocolate - it's all good! But I guess my favorite would be Snickers. And Toblerone... oh, and Mounds. See - I told you, anything chocolate is ME! I love Raspberry Chocolate Bliss. The Best!!! I love Kit Kat bars! I like a Hershey's bar (plain) but my favorite chocolate is from the Russell Stover store. I go and get the "oops" 3-lb packages, 2 for 12.50. The candy tastes just as good but it's slightly the wrong shape, etc. Yum yum! Tough call....I love many kinds. Milky Way is good. My all-fave is Dove dark chocolate, though. I love 3 musketeers and Hershey bars. Thanks for the great giveaway. Hi Lisa, I didn't know whether you would have time this month, but I wanted to tell you about it just in case...'cause I know you love tea parties, ...Jan, at Jan & Tom's Place, is having another online Tea Party, August 8th. If you can't make it this month, they are going to try to do one each month. You can link up to them at my blog, ...can't remember their link address off the top of my head! LOL! I participated last month, but I'm out of ideas! :) I did another tea party segment that lasted about 6 weeks, back around April, so I would be repeating myself. Maybe in the future I will come up with new tea party material! They are lots of fun! Hope you arrived safely at your dad's! Again, I am so sorry for your loss and will be thinking about, and praying for you during this time! I don't know if I can narrow it down to just one candy bar. How about PeanutM&MsReese'sPeanutButterCupsPeanutButterTwixSnickersOh,AnythingWithChocolateWillDo? Ohhh...I love chocolate! My favorite candy bar is Snickers, hands down. Even better when they're frozen...yummy! I've gotta go with the good old snickers, but I'm really loving the Dove Dark Chocolate bites too these days. I love 100 Grand's, just the right amount of chocolate and a whole lotta caramel! Are there really candy bars that don't have chocolate in them? I have 2 favorites: Hershey with Almonds and Nutrageous (though it's been so long since I bought a Nutrageous, I'm not even sure they make them anymore). How do Io love chocolate? Let me count the ways!!!! Looks like I have a lot of competition for your chocolate givaways. I really like the Mark stuff. I hope I win. I think my favorite chocolate, although one wouldn't refer to them as BARs, is Hershey's Kisses especially with almonds or dark! Of course, you shouldn't have a Kiss without a Hug. I am so glad you like my little gift of cups. You are a dear sweet friend and sister in the Lord. I pray for safe travels and comfort to you and your family during this time! I will miss you while you are away. I love Snickers or Carmello bars, and Cadbury Creme Eggs! Thank you for the giveaway! Please include me!!!! Great giveaway! Godiva almond butter truffles- to die for! My favorite candy bar is Twix. Thank you. I don't think I can pick just one. I love Milky Ways, Paydays, Mars Almond Bars, Heath, and anything Hershey's. Thank you for the giveaway. Twix...it has to be Twix! Yum-O!!! My favorite is the milk chocolate Aero bar, yum! My favorite bar is twix. I love caramel. Huge sucker for caramel. YUM! I'm supposed to choose just one?!!?? I love Mounds/Almond Joy, Hershey's Special Dark, and Reese's Peanut Butter Cups!! Great giveaway! Thanks for offering it! My very favorite candy is Hershey's Cookies N' Cream, it's the BEST!! My favorite candy bar is Reese's peanut butter cups. My favorite candy bar is Milky Way Dark. Thanks for the great giveaway! Ok I love me some butterfingers! Thanks for a chance to win some great prizes! I would love to enter..
My favorite is the Payday bar, but I do love chocolate. I was going to say Reeces Peanut Butter Cups but they are not "bars", so my next would be Hershey's Special Dark Chocolate. YUMM!!! Yummy...twix. oh, it's been too long since i had one! I like the dark chocolate 3 Musketeers with mint inside! YUMMM!!!! My favorite has always been Hershey's chocolate with almonds. Lesson plans on apples, 2008 election or math game ideas Good for all children. I love Reese's Peanut Butter Cups! Actually anything with chocolate will do just fine. Thanks for the chance to win your great giveaway! My favorite candy bar is snickers with almonds! My favorite candy bar is the snickers cruncher. I also like the peanut butter twix. Thanks for the entry in the giveaway! My favorite candy bar is the good ole fashioned snickers. Yummmy! Just one favorite candy bar? ;) I'd have to say Almond Joy. 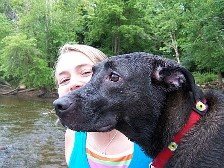 I'd love to win one of your prizes - count me in! I love a SNICKERS bar anytime! Well, a year ago I would've said Snickers, hands down. I have a new favorite, though. It's Reeses Crispy Crunchy. If you haven't tried it, you should. Mmmmm! My favorite candybar is the Crunch bar. So tasty!! Since I was a little girl, my favorite candy bar has been Resees Peanut Butter Cups!! What an awesome prize package!! Thanks for the opportunity to win!! I like to try new candy bars so my current favorite is Three Musketeers mint. Thanks! My fav is the Three Musketeers Bar. my fav candy bar, at the moment it's dark chocolate mint 3 muskateers. and anything else w/ chocolate. My favorite candy bar is a 3 Musketeers! Thanks for the giveaway! My favorite candy bar is the 100 Grand! I love any chocolate, really. But I always enjoy a Toblerone bar. My favorite candy bar is Snickers. Thanks for the contest! I have a serious addiction to Kit Kat bars! Chocolate is my middle name. I love to try anything chocolate. Thanks. My favorite candy bar is Hershey's cookies n cream! I love Reese's Peanut butter cups. Definitely not the fanciest thing in the world..but absolutely delicious! I love Toblerone, but I'll eat just about anything chocolate. My favorite candy bar is Heath, but I can't eat them much these days because they're just so dang hard and crunchy. Perhaps I've eaten too many of them in my lifetime? Thanks for the great giveaway! I actually dont care for candy bars. I worked at Sees Candies for 4 years and its hard to go back to things i can get at the store. I i had to choose, i would say snickers. I like to keep them in the fridge and naw at the hard bar! What a dreamy giveaway thanks for hosting it. I have to pick one candy bar...that is like asking me which child I love more. Ummm I'll go with Butterfingers, I love Butterfingers. The body wash and body butter look great! My favorite candy bar is Snickers. I like a Chunky bar. Don't say you are what you eat! I absolutely love Twix. So bad for me!! The body wash/butter look great, and so do the chocolate cookbooks! So hard to choose a favorite candy bar, but I like simplicity in my candy, so either Kit Kat or Caramel Twix. Yum! I’d take either one right about now. You drive a hard bargain here. I sign up and you dispense the goodies! Yea! Thanks for including me and for being so generous! favorite are "After Eight" Mints...yummm :) thanx! My favorite candy bar is a Symphony by Hersheys. Now I have a craving for one of those things LOL! Thank-you for the great giveaway. My favorite candy bar is 3 Musketeers. I love them, and lol, I usually have a craving for them. A candy bar without chocolate? Really? Cadbury milk chocolate or cream eggs are my favourite. Great prizes! My favorite would have to be Almond Joy. Thanks for the giveaway! Snickers....I'd love some bath goodies. Thanks! Make sure you stop by my blog and enter for a personalized Princess Bracelet made my yours truely. Reece's pieces! irrelevantheart (at) gmail (dot) com ! Thank you! kit kats, as a kid I adored whatshmacallits. Do they make candybars without chocolate?